On the 16th (Thu), stroll through Burleigh Heads Beach and then stroll through Currumbin Wildlife Sanctuary. 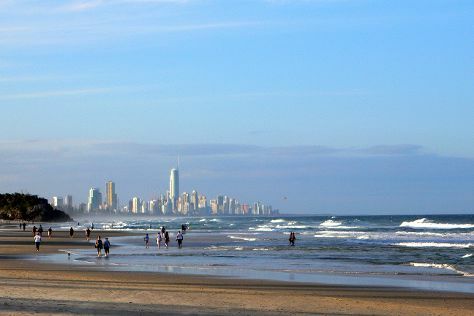 On your second day here, explore the wealth of natural beauty at Burleigh Head National Park, tour the pleasant surroundings at Coolangatta Beach, and then kick back and relax at Kirra Beach. To find reviews, maps, other places to visit, and other tourist information, go to the Gold Coast road trip planner . Springfield, USA to Gold Coast is an approximately 31-hour flight. You'll lose 16 hours traveling from Springfield to Gold Coast due to the time zone difference. In May in Gold Coast, expect temperatures between 74°F during the day and 56°F at night. Finish up your sightseeing early on the 17th (Fri) so you can travel to Port Douglas. Your day-by-day itinerary now includes ABC Dive & Snorkel as well as Scuba & Snorkeling. Start off your visit on the 18th (Sat): discover the deep blue sea with ABC Dive & Snorkel, discover the deep blue sea with a scuba or snorkeling tour, soothe aching muscles at some of the top local wellness centers, then learn about wildlife with up-close encounters at Wildlife Habitat Port Douglas, and finally look for all kinds of wild species at Mossman Gorge. To find maps, photos, ratings, and more tourist information, go to the Port Douglas online trip itinerary builder . Getting from Gold Coast to Port Douglas by combination of flight and shuttle takes about 6 hours. Other options: do a combination of train, flight, and shuttle; or drive. Expect a bit warmer temperatures when traveling from Gold Coast in May; daily highs in Port Douglas reach 82°F and lows reach 69°F. Finish your sightseeing early on the 18th (Sat) so you can drive to Cairns. Reef Experience has been added to your itinerary. Start off your visit on the 19th (Sun): admire the sheer force of Josephine Falls, see some colorful creatures with Reef Experience, and then take in the architecture and atmosphere at St Monica's Cathedral. On the next day, sample the tasty concoctions at Blue Sky Brewery, take in the dramatic scenery at Millaa Millaa Falls, and then take in the dramatic natural features at Babinda Boulders. To find reviews, photos, traveler tips, and more tourist information, go to the Cairns journey maker tool . You can drive from Port Douglas to Cairns in 1.5 hours. Alternatively, you can take a bus; or take a shuttle. May in Cairns sees daily highs of 82°F and lows of 69°F at night. Wrap up your sightseeing by early afternoon on the 21st (Tue) to allow time for travel back home.